Subscribe and share this page with your friends to get up to 25% super early bird discount! Adopting the leading micro Bezels on both sides are only 5mm – as wide as just 5 grains of salt. The screen-to-body ratio is also close to 80%, allowing you to fully immerse in a boundless experience. Enjoy accurate typing and ultimate comfort through the tip of your fingers. Precise interior structure along with the durable aluminum-magnesium alloy—thinnest part is 15mm. Weighing only 2.76lbs. Overall size is 20% smaller than other products of the same class. The Turbo Boost 2.0 help the CPU core frequency reach 2.2GHz. It is 40% higher than the previous generation. 8GB of large-capacity memory is one of the key factors for smooth switching of multiple projects. Aerobook is equipped with 128G storage, in addition, you can also upgrade the storage to 1TB. 8 hours high capacity lithium polymer battery, with the addition of low power consumption CPU Enables an 8 hours long usage. Up to 7 interfaces make it possible to build your personalize workstation. 2. Click the button to refuel the energy bar. 3. Share to get an extra chance. 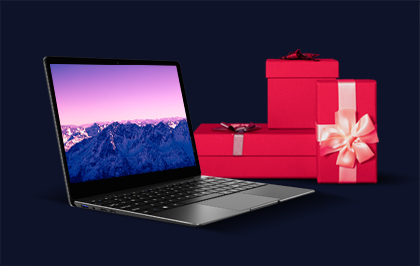 Subscribe and share this page with your friends to get up to 25% super early bird discount!When CHUWI Aerobook campaign is live on Indiegogo, we will notify you in the newsletter !The number of discounts is limited,please register and purchase as soon as possible.